This spectral figure appears to be a three-dimensional shadow in the blurry shape of a person. A nuclear shadow carries with them the utter destruction that tore away their physical forms. The body of any corporeal creature slain by a nuclear shadow’s attacks is instantly reduced to dust as per the spell disintegrate. Though they are three-dimensional beings, a nuclear shadow appears to be a shadow cast across a surface. In areas of normal light, a DC 19 Perception check must be made to even notice them, with this DC increasing to 23 in dim light, while in areas of darkness they are considered invisible. Death is often a traumatic event, and the fear, horror, grief, disgust, anger, despair, and other strong emotions of a creature at the moment of their death may be enough on their own or in concert with outside forces to create an undead creature. Often this involves reanimating the body of the deceased in a shambling imitation of life-powered by a spark of life’s antithesis and often bearing warped or mutated features as a result of their unnatural creation. Other times the mind and emotions of a creature are strong enough on their own to manifest as incorporeal beings on their own, foregoing physical form for an existence of pure spirit. But in some cases, there is no choice to be made. When a creature is killed in something so destructive that the body is utterly destroyed without a trace, so fast that they never get a chance to realize that it’s their death, the being may rise as a spirit known as a nuclear shadow. A nuclear shadow is a wretched creature, never given the chance to realize they’re dead and without a body left behind to trigger this revelation. Attempting to determine the appearance or dimensions of a nuclear shadow is a difficult prospect due to a particular oddity of their form. When viewing a nuclear shadow they do not appear as three-dimensional figures, but rather as a shadow that is projected from their position in such a way to perfectly form their proportions. Most who see them believe it to be simply an optical illusion, an inverse funhouse mirror in which a distorted shadow is projected to appear as a silhouette despite the distances and angles they are projected onto. Furthering this difficulty, this shadow appearance shifts as one circles around, always appearing to the viewer as a perfect silhouette to them no matter how many viewers are looking at them that should return contradictory appearances. With practice and experience, or simply through acclimatization to such visual tricks, one can come to view them as simple silhouettes of an invisible being despite the disorientation that comes from viewing the backgrounds shift and move through and under them. 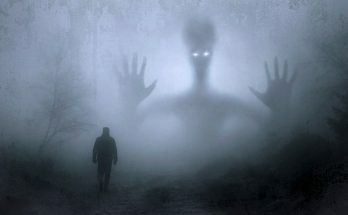 Those who have never encountered them before typically mistake them as simply odd shadows or tricks of the light, which often leads to their deaths. Nuclear shadows are shadows in mind as well as form. When they are killed it is always swift enough that they never realize, and so they continue to act as if they never died. They will continue the step they were taking as they were utterly destroyed and then go on to their place of work, their home, their favorite hang-out spots, mindlessly aping the actions they took in life while never realizing they never actually touch the papers they try to file or the drinks they try to take. They will repeat the same day over and over, spending hours “sleeping” in their bed before rising and trying to prepare for their jobs, making their commute, pretending to do the same tasks they did yesterday, go idle away their time, and then repeat the process the next day. In this, they are single-minded and completely closed off. Though two nuclear shadows may carry out the same silent greeting every day or gather in faux conversation around a water cooler, they do not truly register one another and a single blast shadow will carry out the same actions even if the others it seemed to be interacting with have been destroyed. As the name implies, nuclear shadows are often created in nuclear detonations. Due to the circumstances required to create one, in such examples, nuclear shadows are created in a ring around the blast’s epicenter, close enough to have been killed before they had a chance to notice the detonation but far enough that they didn’t notice the bomb itself. However, this is not the only way they can be created. Victims of the disintegrate spell and those killed in spacecraft collisions they never saw coming are other candidates for becoming nuclear shadows, but only when they never realized the danger before they died. A nuclear shadow’s mindless repetition of their daily routine is an unwary adventurer’s greatest defense of them. Just as they do not truly acknowledge one another, they will dismiss those who encroach on their habitat as simple background characters, the same way no one really notices every single person they pass in the street. Entire expeditions have trekked through a city full of nuclear shadows and come out the other side unscathed without ever realizing they were there, simply because their routines were never disturbed. In other cases, one-sided conversations have been held with nuclear shadows that they took no offense to because it was in a situation where they would have expected or allowed such conversations in life. However, the one certain way to rouse their ire is by obstructing their daily ritual. The moment they are impeded, touched or harmed they take to lashing out, seeking to destroy anything that would hinder them. Usually, this takes the form of simply seizing the offenders and allowing them to crumble to dust, but they can lash out with scouring rays formed from their own shadowy bodies to destroy obstructions from a distance. As soon as the offenders are gone, whether destroyed or hidden, they immediately return to their ritual until disturbed once more. Luckily for adventurers, their lack of acknowledgment once more serves as a boon to adventurers, as crowds of nuclear shadows will simply go about their business around a rampaging one so long as they themselves are not disturbed.